As a digital content manager and web content strategist at the company behind a leading virtual world, I work daily to help curate and create multiple media elements that are then used across a website, email campaigns, social networks and in external paid and non-paid campaigns. Unlike a traditional "editor" role, I'm thinking about more than just the written word. All text content must be readable and understandable, but also findable, actionable and shareable. Is there a clear call-to-action in our content? What is our objective for each campaign? Further, I also have to consider how content might be re-distributed and/or re-purposed in other channels of delivery. For example, will it be easily indexed on search engines? Do we make it easy for people to share it via social networks, such as Facebook? Would they even want to? Why or why not? There's lots to consider, to be sure. 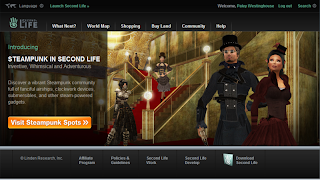 An example of a "landing page" targeted at the steampunk community. For example, a key mission is to make the website easier to navigate while helping the company to meet critical "key performance indicators" (KPIs), such as acquisition (attracting new users) and retention (keeping existing users happy and engaged). We also want to build and amplify brand loyalty. For acquisition, a key consideration is how friendly our content is for search engines. What can we do to make sure that our site comes up for key searches on Google and other search engines? This is where Search Engine Optimization (SEO) strategy becomes critical. This means that you might actually develop targeted promo campaigns centrally themed to specific popular keyword searches and/or interests. For example, we recently did a whole campaign around the emerging machinima artform. There have also been landing pages and campaigns developed for education, romance, pets, goth and more, The "best practices" and tactics for SEO will be discussed in greater detail in the coming weeks. 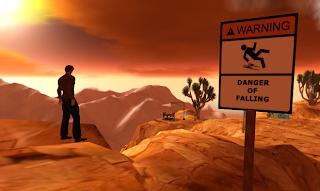 A banner from a "landing page" for a machinima-themed campaign. For retention, the site should have functionality that encourages people to stick around. The Destination Guide project, which is a directory of cool content inside the virtual world, perfectly fits that objective. There's also deep Facebook integration there, which allows for easy sharing of cool spots that people may want to comment on and/or show off to friends. Why is this important? It helps to build engagement and brand loyalty among existing users -- but also lets them help spread the word of how cool SL is. This is a critical and cost-effective way to help expand awareness of SL to people that might not even be aware of it! An example of a promo video on the official YouTube channel for SL. The Content Marketing Institute (CMI) has a fantastic blog post with an essential checklist (.pdf file) that is extremely helpful in determine what you will say and how you will say it in your content and campaign creations. An example of a promo shot viewable on the SL blog.